WAILOTUA, Fiji – For most of Buisalia Tevita’s life, prayers and luck were all her Fijian community could rely on to protect itself from the cyclones, floods or landslides that regularly hit the islands. “During a disaster, everything (is) in a mess. People don’t know what to do,” said Tevita, who lives in Wailotua Village No. 1, located at the foot of steep cliffs about 65 km (40 miles) north of Fiji’s capital Suva. “When it floods, people just help themselves and leave behind old people, mothers with babies. And no one cares” about helping others, she told the Thomson Reuters Foundation. That is now changing. For the past five years, all 250 residents in the disaster-prone village have been undergoing emergency disaster training. That has included creating an evacuation plan, forming disaster committees, and learning basic first aid. 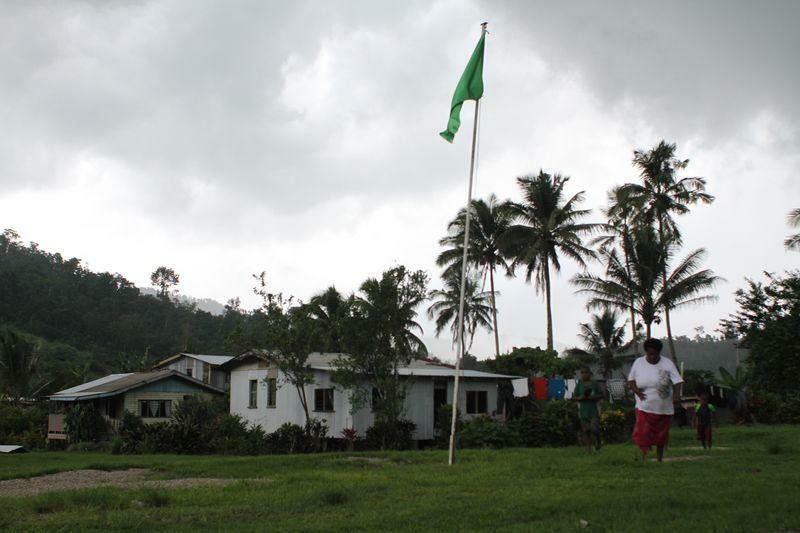 A simple colour-coded flag system also now helps communicate cyclone warnings to villagers, whether or not the mobile phone network is working. A white flag warns families to prepare for evacuation, yellow signals a storm is 24 hours from landfall, and red means it’s time to leave immediately. Tevita, the wife of the village’s chief, believes the training from Fiji’s Red Cross helped band the community together and was what saved them last year when Cyclone Winston, the most powerful storm to make landfall in the southern hemisphere, hit. “If (the Red Cross) were not here before Winston came, I think some of us would have lost our lives,” she said. The storm killed more than 40 people in Fiji and caused 2 billion Fijian dollars ($950 million) in damages in the country. In the low-lying South Pacific nation, natural disasters are expected to become more frequent and severe due to climate change. Risks vary from rising sea levels to more floods and landslides, destruction of crops and increases in diseases such as dengue fever and typhoid. Tevita said that her village has seen most houses go underwater during major floods and often has to wait days before the village is accessible by road again. Fiji’s government, aware of the growing risks, is stepping up action to combat them. In a November report done with the World Bank, the government said it is spending almost 10 percent of its gross domestic product to guard against natural disasters, more than quadruple the level of five years ago. It is set to spend more than 350 million Fiji dollars ($166 million) this year on relocating villages, building improved bridges and roads and on responding to climate change-related disasters. Three villages have already been moved and another 43 are set to be shifted, the country’s attorney general said last month. But teaching villages how to cope better with disasters is also key to saving lives and money, said Eseroma Ledua, head of operations at Fiji’s Red Cross. “Having communities know and understand how and what to do during a disaster is vital… It’s now part of our daily life, so we must adapt to these changes and learn how to mitigate these risks,” he said. Where possible, it is better for villagers to disaster-proof their homes rather than relocate, which can be a lengthy and expensive process, Ledua said. Tevita said that’s just what her village hopes to do. Surrounded by cliffs and unable move uphill, residents of Wailotua Village No. 1 are being encouraged to raise their houses off the ground if they can afford to, she said. Though the government has discussed relocation with residents, Tevita said she is confident that being prepared for disasters is a better solution. “We love this village. The people don’t want to move. So, from our training, we are starting to do things better,” she said. “We feel like it’s okay. If a hurricane comes, we are ready,” she said.